The Ski.com To The Mountains Sweepstakes: Family is open only to legal residents of Canada (excluding Quebec) and the fifty (50) United States (including District of Columbia) are at least eighteen (18) years old. 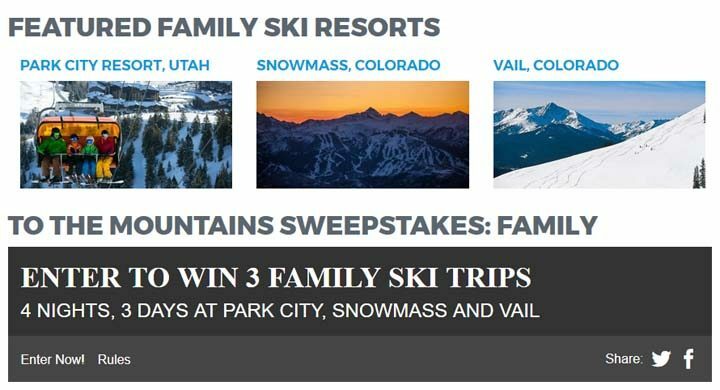 The Ski.com To The Mountains Sweepstakes: Family ends on September 30 at 11:59 p.m. MST. To enter online, visit ski.com/family and access the online entry form. One entry per person is allowed. The Prize Winners will receive one of the following: a Park City ski vacation including: four (4) nights’ lodging at the Grand Summit, four (4), three (3) day lift tickets; a Snowmass ski vacation including: four (4) nights’ lodging at Timberline Condominums, four (4), three- (3) day lift tickets; a Vail ski vacation including: four (4) nights’ lodging at Vail Square, a RockResort, four (4), three (3) day lift tickets. The Approximate Retail Value (“ARV”) of Prizes is $12,000.00. Three of the best trips to win!